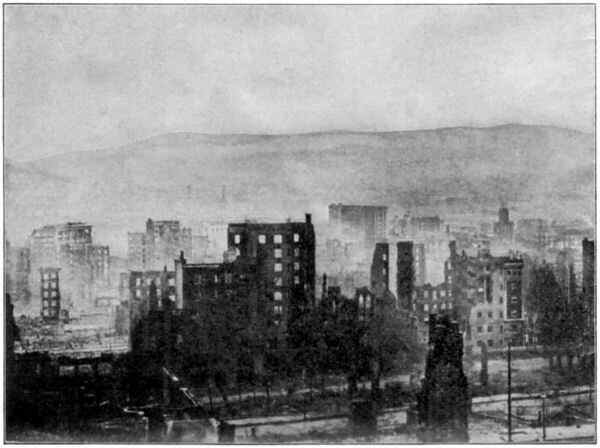 The San Francisco Earthquake: a view of the ruined city. 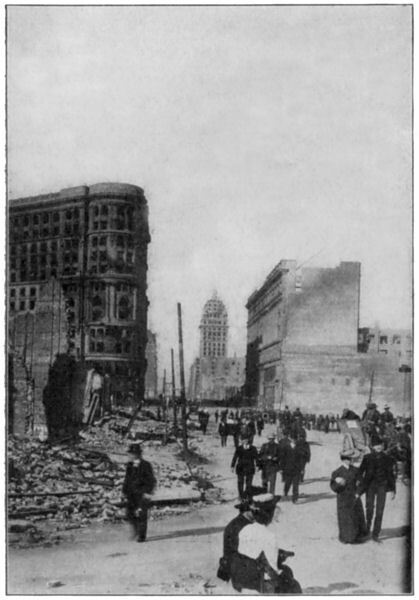 At 5:12 A.M. on Wednesday, April 18, 1906 a major earthquake struck the city of San Francisco and the surrounding area. The earthquake had a likely magnitude of about 7.8 on the richter scale, though some estimates suggest that the quake may have been as high as 8.2. 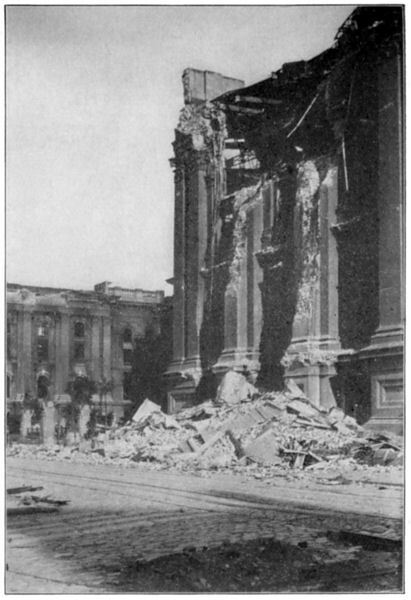 The earthquake struck near the center of the city, leading to the collapse of many buildings from the shock. 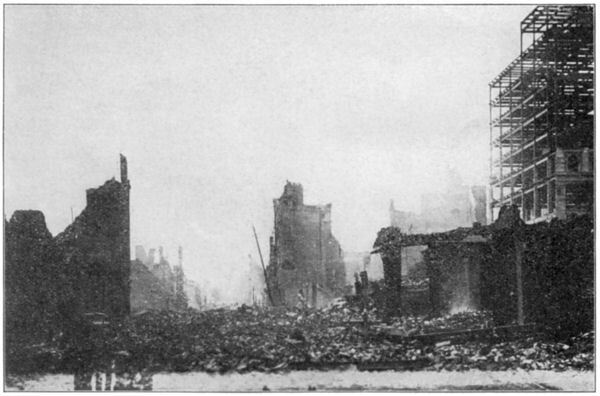 Then fires started throughout the city which raged uncontrolled for days. 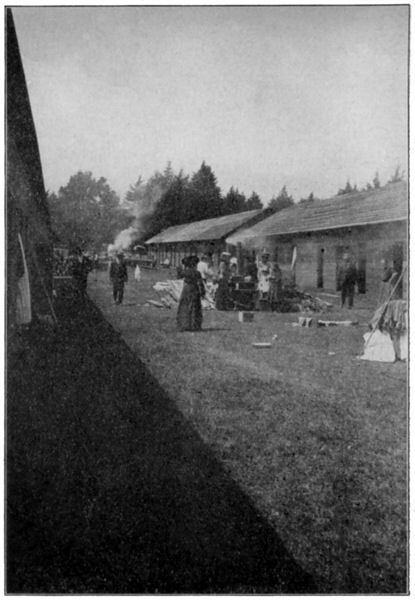 The flames were fought by local citizens and the army, who often used dynamite to demolish homes and create a fire break in the path of the fire. 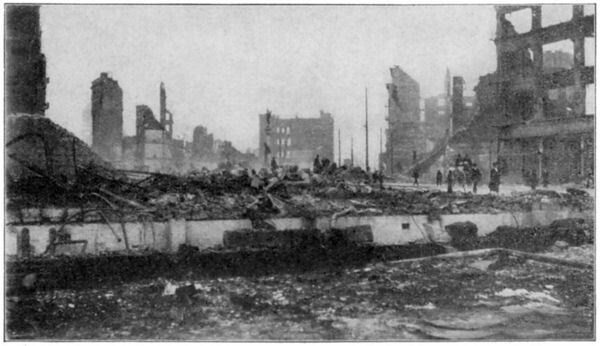 About 3,000 people lost their lives, and the city was left in ruins. To a world grown weary of natural disasters – Katrina, the Haiti Earthquake, the Indonesian Tsunami, the San Francisco earthquake may seem almost of no consequence. After all the loss of life was far less than many more recent disasters. 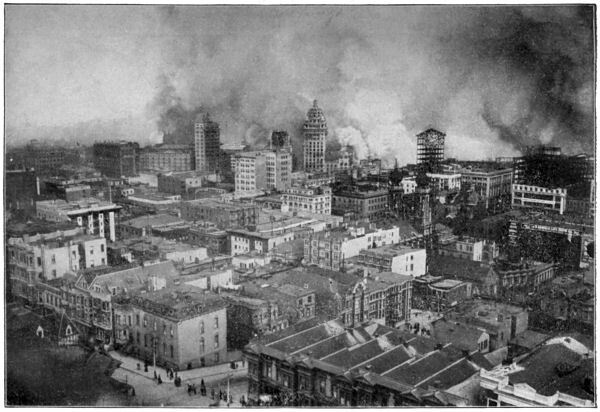 However we must not underestimate the shock of the San Francisco earthquake on the psyche of the city or the nation. 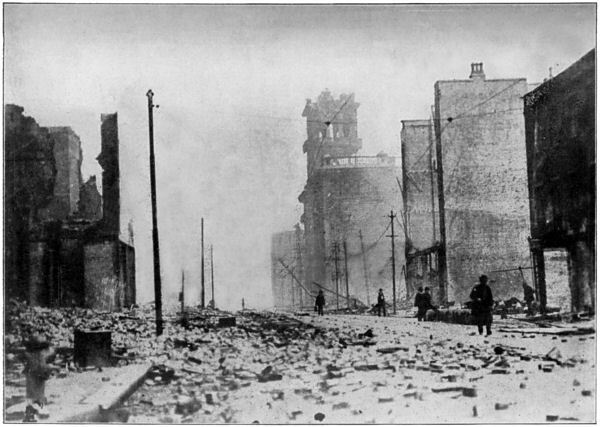 This earthquake was at the time an unprecedented disaster. 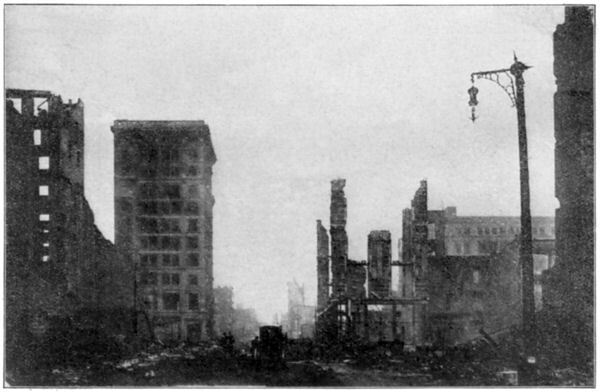 The picture above shows what is left of the once thriving business district of San Francisco. 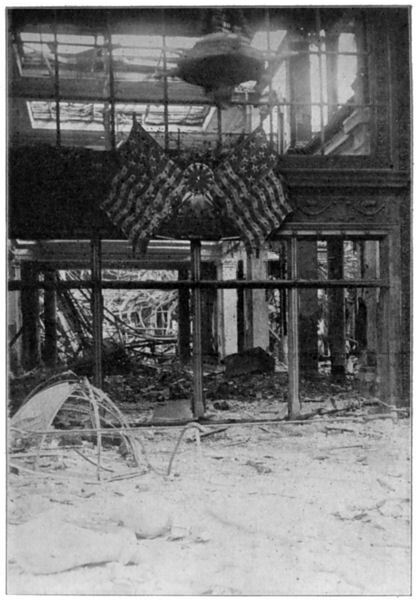 Even when the outer facade of the building did not collapse, the interior floors often fell into a heap of rubble. This picture was taken from Nob Hill which offered a good panoramic view of the earthquake. 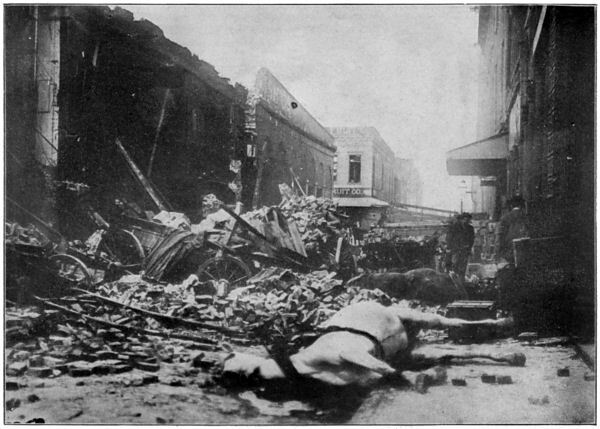 The above picture is an interesting snapshot of the aftermath of the earthquake. 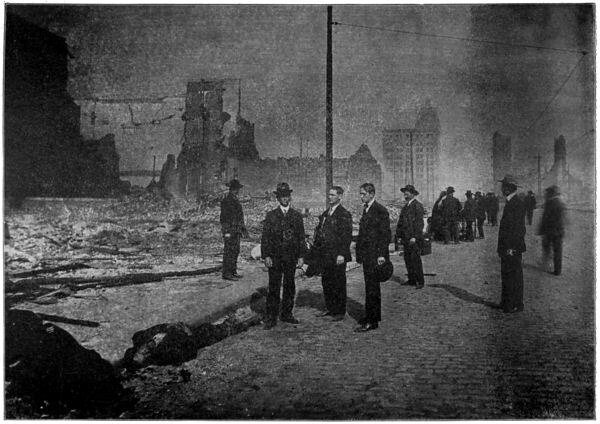 A bunch of men in suits and hats, probably businessmen, are standing nonchalantly on Market Street, surrounded by the ruins of their city. Lying in the gutter is a dead man, likely a looter shot by soldiers brought in to restore order. 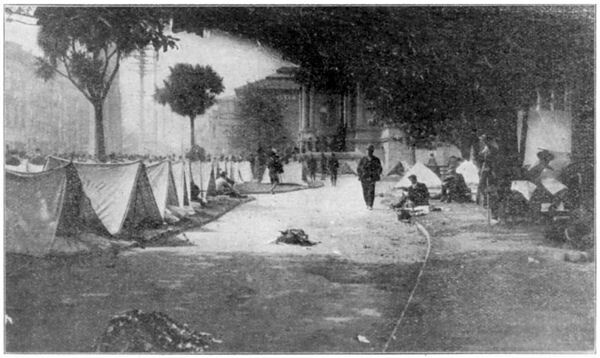 The above picture is of a mortuary set up by the National Guard in Jefferson Square to collect the dead of the San Francisco earthquake. The guardsman is cataloguing the dead by recording their description and names. 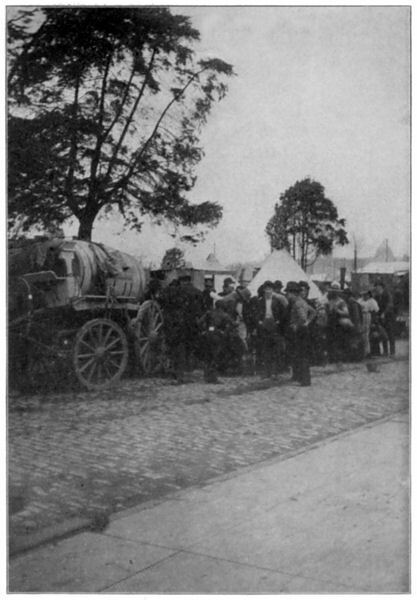 There are supplies of embalming fluids and other funerary supplies set up nearby. 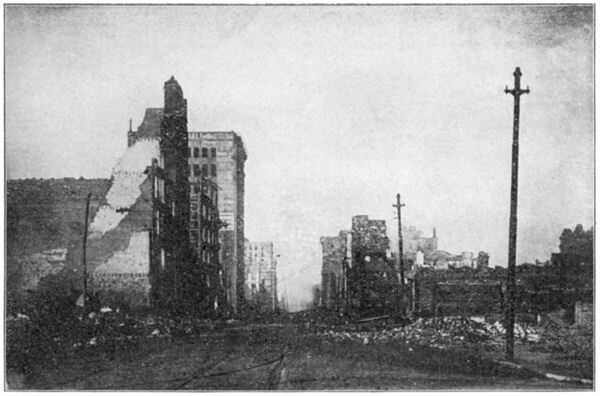 It was 5:15 o’clock in the morning when the terrific earthquake shook San Francisco and the surrounding country. One shock apparently lasted two minutes and there was an almost immediate collapse of flimsy structures all over the former city. The water supply was cut off and when fires broke out in various sections there was nothing to do but to let the buildings burn. Telegraphic and telephone communication was shut off. 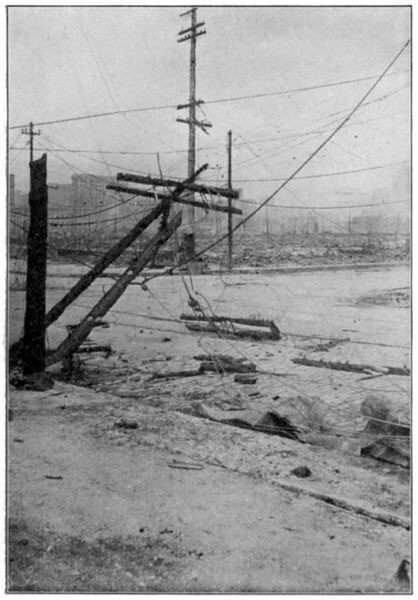 Electric light and gas plants were rendered useless and the city was left without water, light or power. 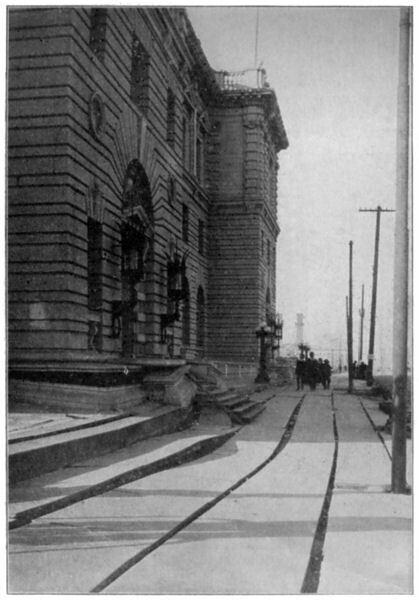 Street car tracks were twisted out of shape and even the ferry-boats ceased to run. 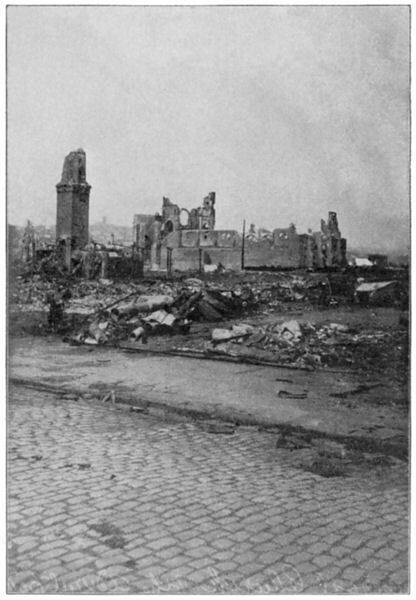 Scarcely had the earth ceased to shake when fires broke out simultaneously in many places. 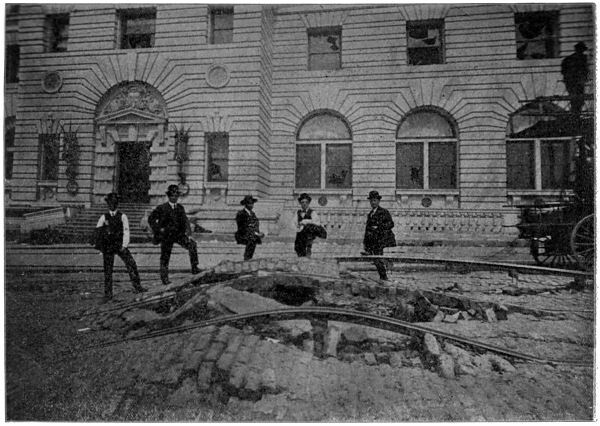 This photograph gives an idea of just how much the earth heaved during the quake: the trolley car tracks have been bent upwards from the ground. 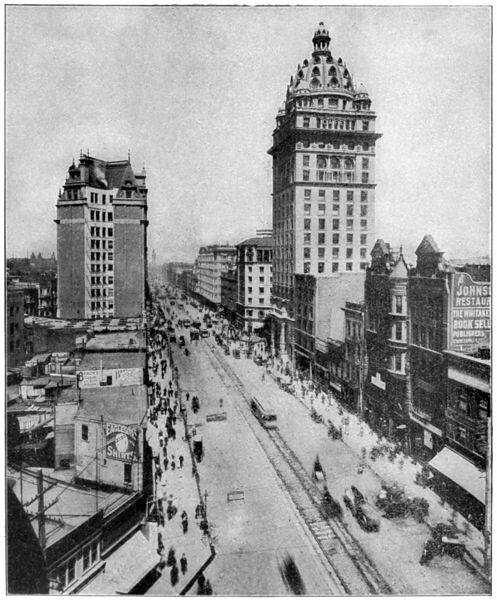 On the right can be seen the girders of a modern building which have remained standing while all around it the brick and mortar building shave crumbled completely. 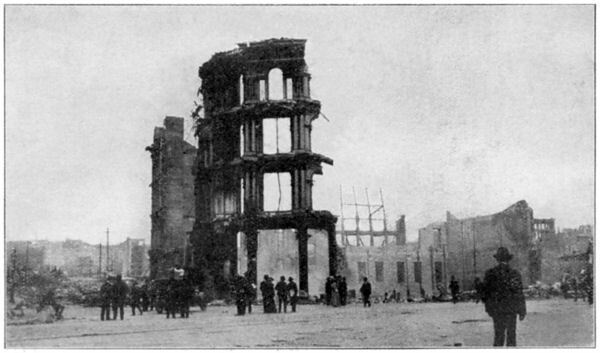 However the strong metal frame of the new building did not save it from damage: all of its outer walls have collapsed. 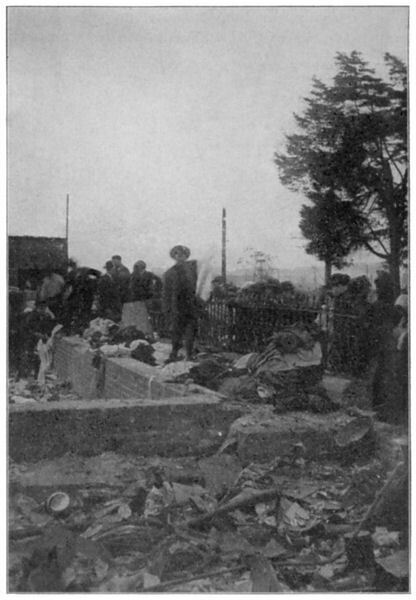 There were so many dead that in many cases immediate cremation was deemed necessary to prevent the spread of disease. Many bodies were never identified. 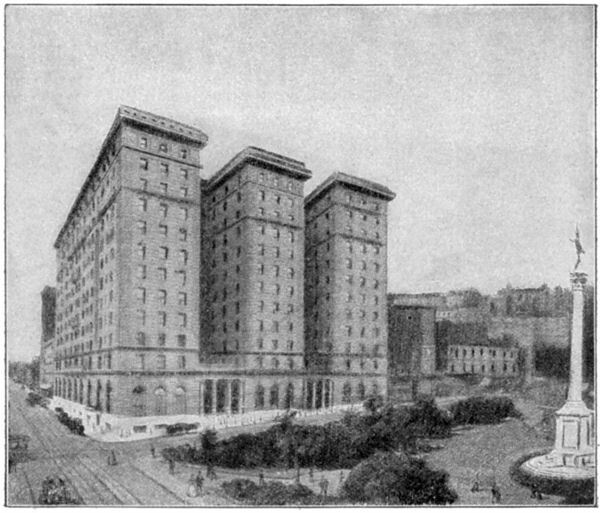 The landscape of the city was changed forever. 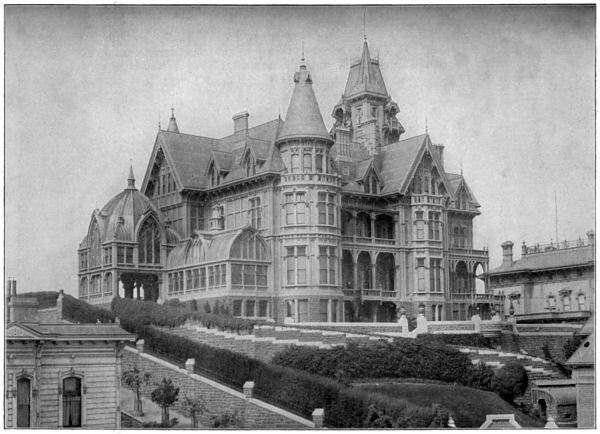 The palatial homes on Nob Hill were destroyed by the flames. 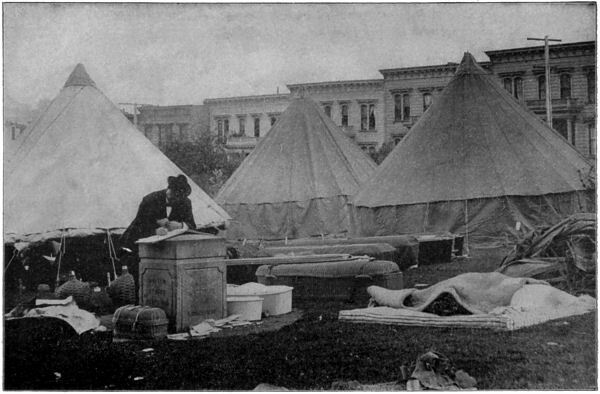 Thousands were left homeless; refugees fled the city by ferry to Oakland and other points. 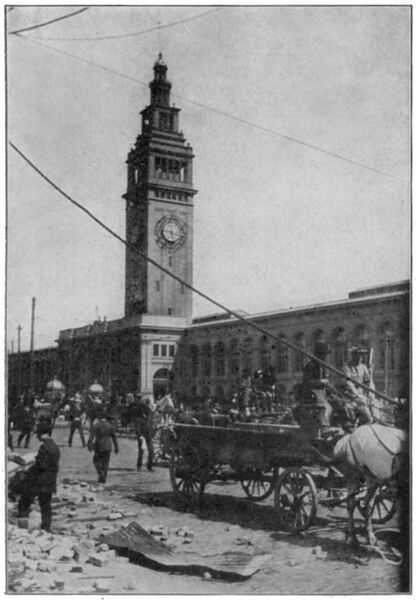 Below is a picture of the ferry terminal, from which many of the injured were evacuated. 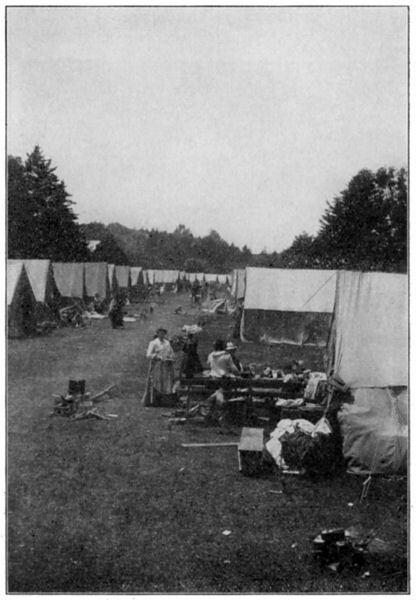 Those that remained in the city faced many hardships. With the infrastructure destroyed, exposure and lack of food and water became the enemy. The armed forces organized a relief operation. 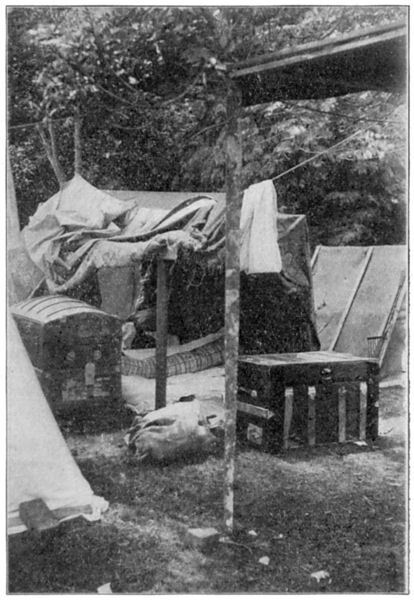 Soldiers quickly erected tent cities where the suddenly homeless could find shelter. 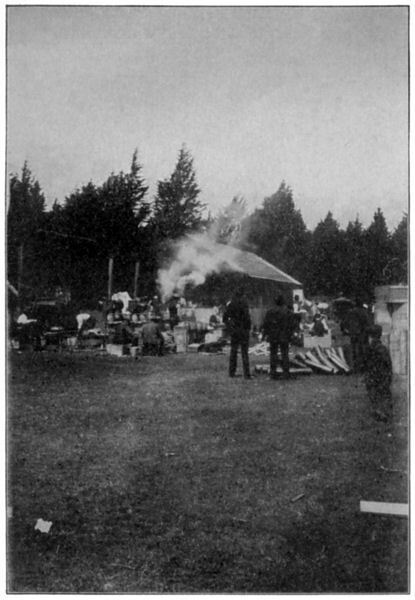 Below is a picture of the tent city erected in Golden Gate Park. 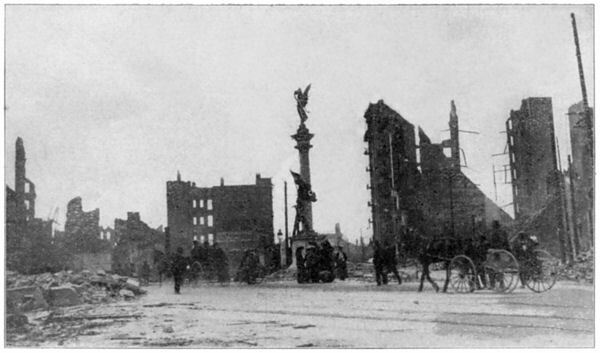 Even where buildings remained standing they were too structurally damaged to reoccupy. 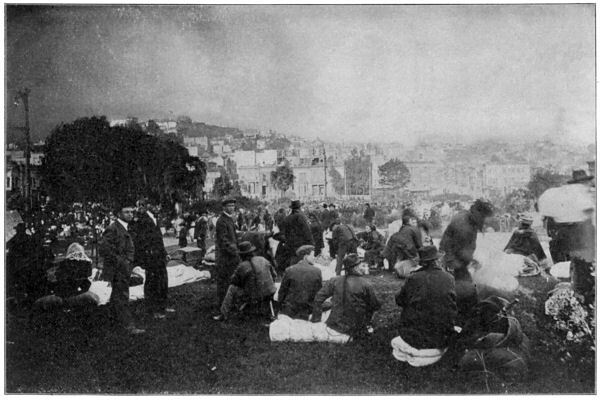 Many San Franciscans had to move into the streets in front of their homes. 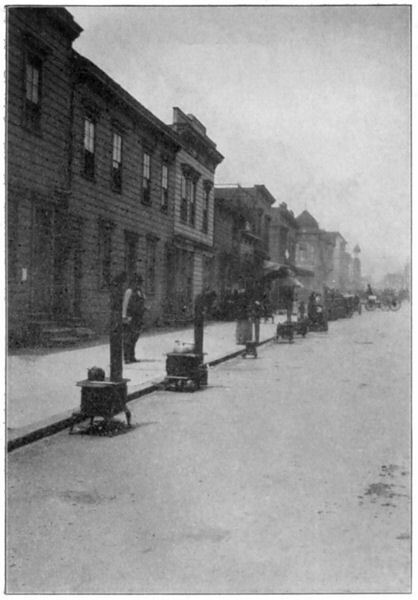 Below is a photograph of a street with dozens of cooking stoves on the sidewalk, a scene that became very common after the earthquake. 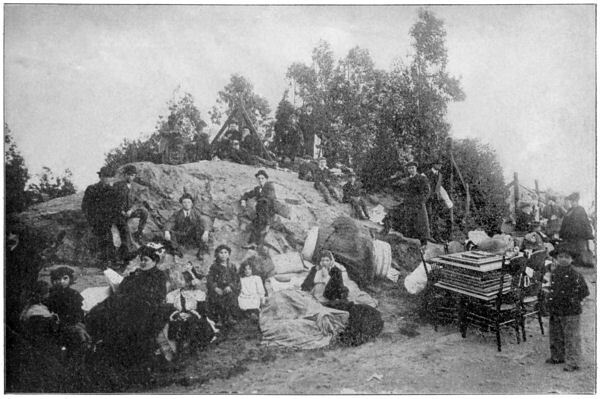 Refugees from the fire that destroyed their homes huddle amid what few possessions they were able to carry away to the safety of Telegraph Hill. 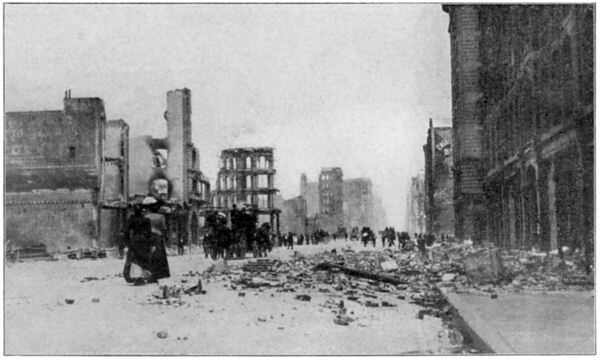 One of the hardest hit sections was San Francisco’s famous China Town, which was almost completely destroyed by fire. 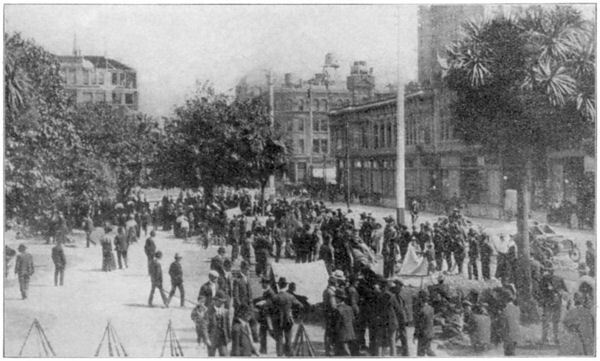 The picture below shows several thousand Chinese Americans who fled from China Town to the safety of a park. Survivors of the quake look for the names of loved ones. 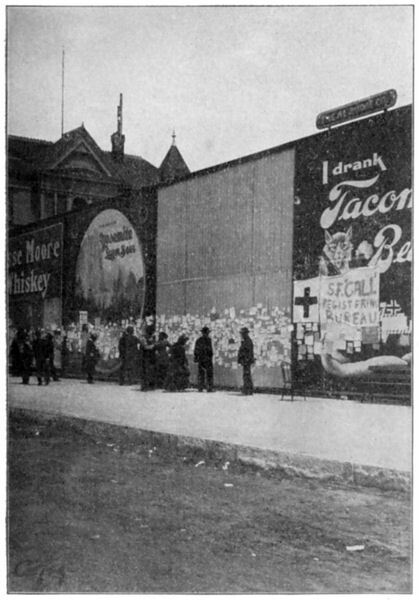 In the picture above survivors are scanning a wall on which the names and contact information of other survivors have been placed. 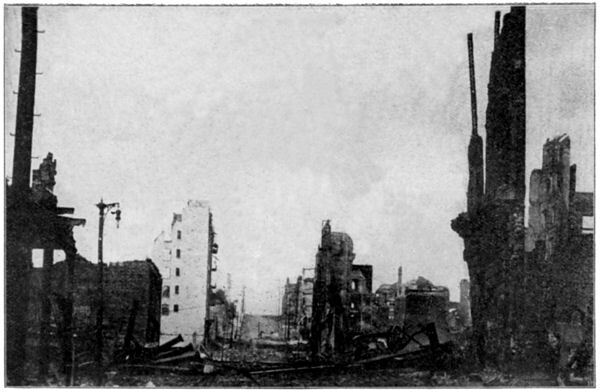 With communications destroyed and thousands of people scattered by teh devastation, it many friends and families were separated. This wall served as a collection point. It was a scene that would become painfully familiar again during teh 9-11 disaster. 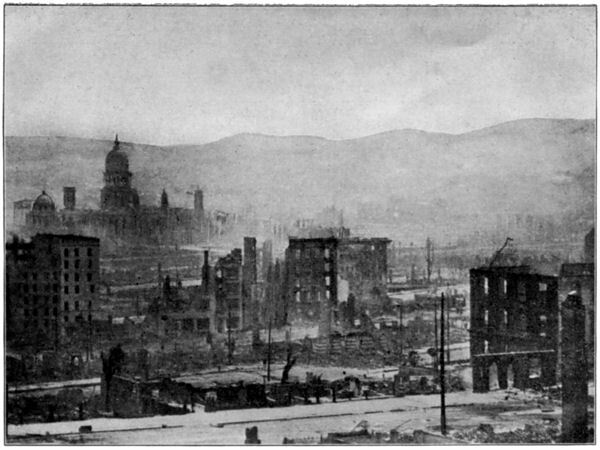 After the earthquake the city of San Francisco was left in ruins. 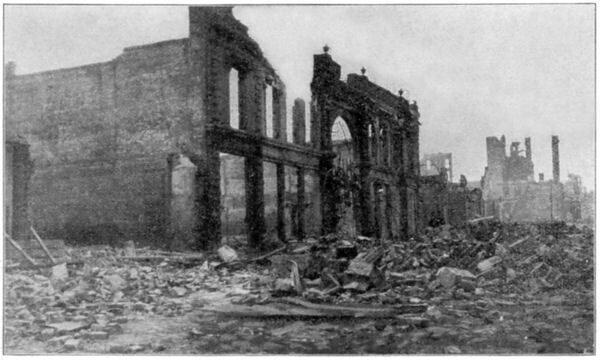 The city resembled the devastated what would become commonplace in a mere 34 years: the bombed out cities of World War 2 such as Coventry or Nurenburg. Unexampled as was the loss of property in San Francisco the disaster in that respect alone was converted into a permanent benefit. 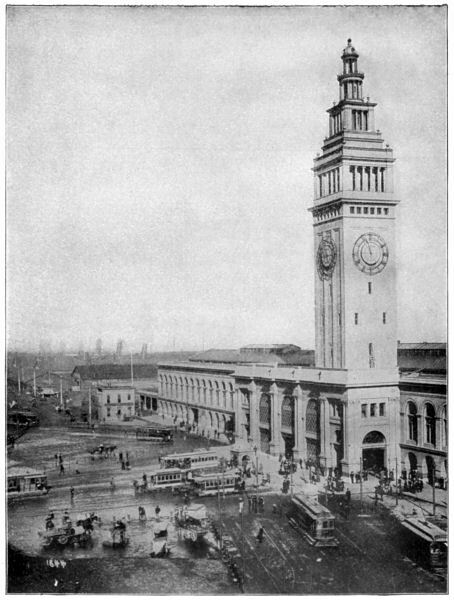 No other city with the exception of Chicago ever had such a grand opportunity of rebuilding upon a basis of permanency and beauty. To a certain extent, they were right. 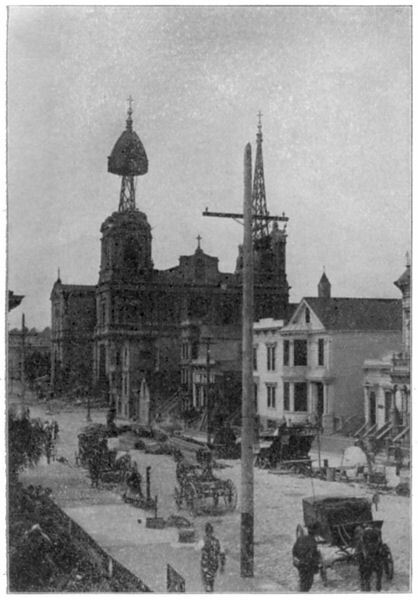 San Francisco was rebuilt and remains today a vibrant beautiful city.